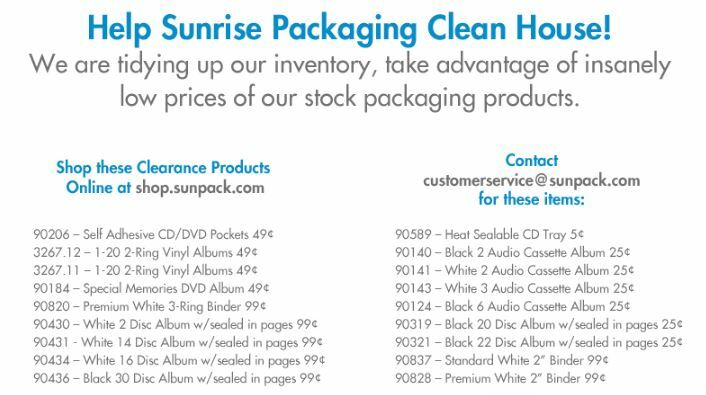 Check out our online store www.shop.sunpack.com for amazing deals on your favorites stock packaging solutions. The list below shows extremely marked down pricing on clearance items. Everything must go by the end of the year, so act fast to take advantage of amazing deals. Included in this list are thermoformed disc albums that include pages, self-adhesive accessories, and stock vinyl binders. Simply go to the online store and search the part number, or contact customer service to order!